Eagle Scholarship student Winnie Leonce ended #1 of the entire school in mid-year, continuing her top ranking from last year. Winnie joined our Eagle Scholarship program in 2011 and has been doing very well throughout. 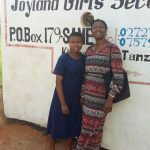 Originally from Kilimatembo, her father is a science and geography teacher at Kilimatembo primary school. Her mother is a farmer. She has two brothers and two sisters, whom are all younger. Her parents are extremely proud of her performance and so are we!